1 Season chicken, if desired, with salt and ground black pepper. 2 In 12-inch nonstick skillet, melt Spread over medium-high heat and cook chicken 8 minutes or until chicken is thoroughly cooked, turning once. Remove chicken to serving platter and keep warm. 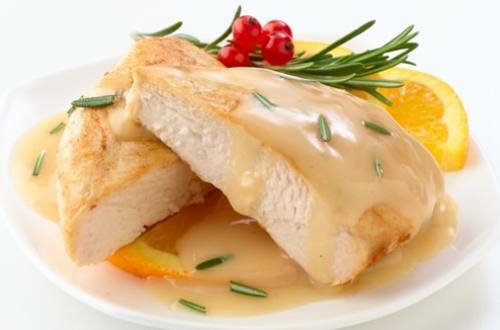 3 In same skillet, stir in Knorr® Roasted Chicken gravy mix blended with water, orange juice and rosemary. Bring to a boil over high heat, stirring constantly. Reduce heat to low and simmer, stirring occasionally, 3 minutes. To serve, pour sauce over chicken. Serve, if desired, with hot cooked rice and garnish with orange slices.